Unfortunately air fares to Brazil have shot up recently and in consideration of those costs, we have decided to reschedule this trip for next year. We will run the same route at the end of the July — please look for a save the date in the next few months and registration to open in early 2012. This summer, we are running two trips concurrently — one is an SCAA led group for marketing, sales, and other professionals not deeply involved with the technical aspects of buying coffee, but who have responsibilities for communicating the coffee story to customers. 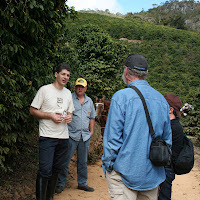 On this trip, we will taste many coffees but thedialogue will focus more on how to translate that information forward. We’ll also take a broader look at the coffee community, considering social and environmental aspects to coffee. The second group will be led by the Roasters Guild and is designed for those who want to deepen their technical knowledge. Included in this trip are two classes that count toward Roasters Guild Apprentice Certification: RP206 (credit A6) Basics of Coffee Farming and RP207 (credit A7) Basics of Green Coffee Processing. In addition, there we will be cuppings of various crops from the farms that we visit and a focus on processing, storage, and other factors affecting quality that roasters should be knowledgable about. (1) Parana is located in a subtropical region with extraordinary volcanic soil, known for coffees with high sweetness, strong body, and notes that vary from fruity to citric floral, caramel, and chocolate. (2) Alta Mogiana is located in the northeastern part of Sao Paulo state in the highlands and traditionally known for producing excellent fruity coffees with chocolate and nut flavors. (3) Sul de Minas is one of Brazil’s most well known and prized coffee growing areas and home of multiple Cup of Excellence award winners. If you are interested but concerned about acquiring a visa in time, we can assist in expediting the visa process. We only have nine slots for each group so if you’d like to join us, please consider registering as soon as possible. Previous Post Previous post: Your Chance to See Your Face in The Chronicle!